Notable beers join steaks and seafood in Brea's lively downtown area. : This expansive brewery boasts artsy, eclectic décor reminiscent of a brick warehouse. The sprawling structure provides a southern anchor to the lively bustle of downtown Brea. 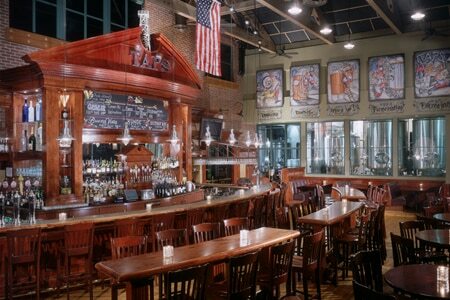 TAPS Fish House & Brewery pours several of its own beers, such as the Cream Ale and Irish Red. Beer lovers can't get enough of the brewery's special barrel-aged brews, as well as its seasonal and rotating "on nitro" options. The kitchen matches the brewery's panache with Midwestern Angus steaks, daily specials and fresh seafood dishes like the Australian barramundi with fingerling potatoes and tomato broth or the achiote marinated Atlantic salmon. The Sunday jazz brunch is a real treat (and a value), when the raw bar and several tables in the bar area are loaded with a variety of delicacies. Guests pile their plates with oysters, spicy peeled shrimp cocktails, imported cheeses and cured meats, while prepared entrées range from eggs Benedict to biscuits and gravy, and chefs at various stations make waffles, omelets and the chef's weekly egg creations. A carving station rotates prime rib, smoked turkey and spicy hot link sausages. Waiters keep the Champagne flutes --- or, for real beer fanatics, pint glasses --- full.